A quasi-stellar radio source is a very energetic and distant active galactic nucleus. Quasars are extremely luminous and were first identified as being high redshift sources of electromagnetic energy, including radio wavesand visible light, that were point-like, similar to stars, rather than extended sources similar to galaxies. While the nature of these objects was controversial until the early 1980s, there is now a scientific consensus that a quasar is a compact region in the center of a massive galaxy, that surrounds its central supermassive black hole. Its size is 10–10,000 times the Schwarzschild radius of the black hole. The quasar is powered by an accretion disc around the black hole. Quasars show a very high redshift, which is an effect of the expansion of the universe between the quasar and the Earth. When combined with Hubble’s law, the implication of the redshift is that the quasars are very distant—and thus, it follows, very ancient objects. They tend to inhabit the very center of active, young galaxies, and are among the most luminous, powerful, and energetic objects known in the universe, emitting up to a thousand times the energy output of the Milky Way, which contains 200–400 billion stars. This radiation is emitted across the spectrum, almost equally, from X-rays to the far-infrared with a peak in the ultraviolet-optical bands, with some quasars also being strong sources of radio emission and of gamma-rays. In early optical images, quasars looked like single points of light (i.e., point sources), indistinguishable from stars, except for their peculiar spectra. With infrared telescopes and the Hubble Space Telescope, the “host galaxies” surrounding the quasars have been identified in some cases. These galaxies are normally too dim to be seen against the glare of the quasar, except with special techniques. Most quasars cannot be seen with small telescopes, but 3C 273, with an average apparent magnitude of 12.9, is an exception. At a distance of 2.44 billion light-years, it is one of the most distant objects directly observable with amateur equipment. Some quasars display changes in luminosity which are rapid in the optical range and even more rapid in the X-rays. Because these changes occur very rapidly they define an upper limit on the volume of a quasar; quasars are not much larger than the Solar System. This implies an astonishingly high energy density. The mechanism of brightness changes probably involves relativistic beaming of jets pointed nearly directly toward us. The highest redshift quasar known (as of June 2011) is ULAS J1120+0641, with a redshift of 7.085, which corresponds to a proper distance of approximately 29 billion light-years from Earth (see more discussion of how cosmological distances can be greater than the light-travel time at Metric Expansion of Space). Quasars are believed to be powered by accretion of material into supermassive black holes in the nuclei of distant galaxies, making these luminous versions of the general class of objects known as active galaxies. Since light cannot escape the super massive black holes that are at the center of quasars, the escaping energy is actually generated outside theevent horizon by gravitational stresses and immense friction on the incoming material. Large central masses (10(6) to 10(9) Solar masses) have been measured in quasars usingreverberation mapping. Several dozen nearby large galaxies, with no sign of a quasar nucleus, have been shown to contain a similar central black hole in their nuclei, so it is thought that all large galaxies have one, but only a small fraction emit powerful radiation and so are seen as quasars. The matter accreting onto the black hole is unlikely to fall directly in, but will have some angular momentum around the black hole that will cause the matter to collect in an accretion disc. Quasars may also be ignited or re-ignited from normal galaxies when they merge and the black hole is infused with a fresh source of matter. In fact, it has been suggested that a quasar could form as the Andromeda Galaxy collides with our own Milky Way galaxy in approximately 3–5 billion years. The Chandra X-ray image is of the quasar PKS 1127-145, a highly luminous source of X-rays and visible light about 10 billion light years from Earth. An enormous X-ray jet extends at least a million light years from the quasar. Image is 60 arcsec on a side. RA 11h 30m 7.10s Dec -14° 49′ 27″ in Crater. Observation date: May 28, 2000. Instrument: ACIS. More than 200,000 quasars are known, most from the Sloan Digital Sky Survey. All observed quasar spectra have redshifts between 0.056 and 7.085. Applying Hubble’s law to these redshifts, it can be shown that they are between 600 million and 28.85 billion light-years away (in terms of comoving distance). Because of the great distances to the farthest quasars and the finite velocity of light, we see them and their surrounding space as they existed in the very early universe. Most quasars are more distant than three billion light-years. Although quasars appear faint when viewed from Earth, the fact that they are visible at all from so far is due to quasars being the most luminous objects in the known universe. The quasar that appears brightest in the sky is 3C 273 in the constellation of Virgo. It has an average apparent magnitude of 12.8 (bright enough to be seen through a medium-size amateur telescope), but it has an absolute magnitude of −26.7. From a distance of about 33 light-years, this object would shine in the sky about as brightly as our sun. This quasar’s luminosity is, therefore, about 4 trillion (4 × 10(12)) times that of our sun, or about 100 times that of the total light of giant galaxies like our Milky Way. However, this assumes the quasar is radiating energy in all directions. 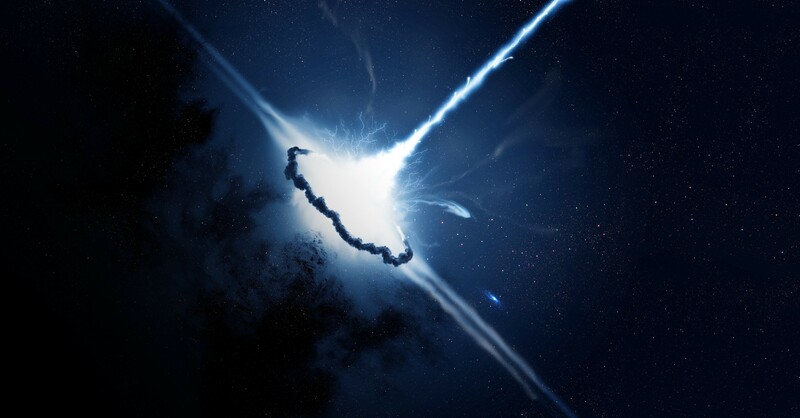 An active galactic nucleus can be associated with a powerful jet of matter and energy and is radiating preferentially in the direction of its jet. In a universe containing hundreds of billions of galaxies, most of which had active nuclei billions of years ago but only seen today, it is statistically certain that thousands of energy jets should be pointed toward us, some more directly than others. In many cases it is likely that the brighter the quasar, the more directly its jet is aimed at us. The hyperluminous quasar APM 08279+5255 was, when discovered in 1998, given an absolute magnitude of −32.2. High resolution imaging with the Hubble Space Telescope and the 10 m Keck Telescope revealed that this system is gravitationally lensed. A study of the gravitational lensing of this system suggests that it has been magnified by a factor of ~10. It is still substantially more luminous than nearby quasars such as 3C 273. Quasars were much more common in the early universe. This discovery by Maarten Schmidt in 1967 was early strong evidence against the Steady State cosmology of Fred Hoyle, and in favor of the Big Bang cosmology. Quasars show where massive black holes are growing rapidly (via accretion). These black holes grow in step with the mass of stars in their host galaxy in a way not understood at present. One idea is that jets, radiation and winds created by the quasars shut down the formation of new stars in the host galaxy, a process called ‘feedback’. The jets that produce strong radio emission in some quasars at the centers of clusters of galaxies are known to have enough power to prevent the hot gas in these clusters from cooling and falling onto the central galaxy. Quasars’ luminosities are variable, with time scales that range from months to hours. This means that quasars generate and emit their energy from a very small region, since each part of the quasar would have to be in contact with other parts on such a time scale to allow the coordination of the luminosity variations. This would mean that a quasar varying on a time scale of a few weeks cannot be larger than a few light-weeks across. The emission of large amounts of power from a small region requires a power source far more efficient than the nuclear fusion that powers stars. The release of gravitational energy by matter falling towards a massive black hole is the only process known that can produce such high power continuously. Stellar explosions – supernovas and gamma-ray bursts – can do likewise, but only for a few weeks. Black holes were considered too exotic by some astronomers in the 1960s. They also suggested that the redshifts arose from some other (unknown) process, so that the quasars were not really so distant as the Hubble law implied. This ‘redshift controversy’ lasted for many years. Many lines of evidence (optical viewing of host galaxies, finding ‘intervening’ absorption lines, gravitational lensing) now demonstrate that the quasar redshifts are due to the Hubble expansion, and quasars are as powerful as first thought. Quasars have all the properties as active galaxies, but are more powerful: their radiation is partially ‘nonthermal’ (i.e., not due to black body radiation), and approximately 10 percent are observed to also have jets and lobes like those of radio galaxies that also carry significant (but poorly understood) amounts of energy in the form of particles moving at relativistic speeds. Quasars can be detected over the entire observable electromagnetic spectrum including radio, infrared, visible light, ultraviolet, X-ray and even gamma rays. 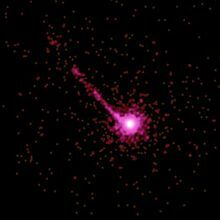 Most quasars are brightest in their rest-frame near-ultraviolet wavelength of 121.6 nm Lyman-alpha emission line of hydrogen, but due to the tremendous redshifts of these sources, that peak luminosity has been observed as far to the red as 900.0 nm, in the near infrared. A minority of quasars show strong radio emission, which originates from jets of matter moving close to the speed of light. When looked at down the jet, these appear as a blazar and often have regions that appear to move away from the center faster than the speed of light (superluminal expansion). This is an optical illusion due to the properties of special relativity. Quasar redshifts are measured from the strong spectral lines that dominate their visible and ultraviolet spectra. These lines are brighter than the continuous spectrum, so they are called ’emission’ lines. They have widths of several percent of the speed of light. These widths are due to Doppler shifts caused by the high speeds of the gas emitting the lines. Fast motions strongly indicate a large mass. Emission lines of hydrogen (mainly of the Lyman series and Balmer series), helium, carbon, magnesium, iron and oxygen are the brightest lines. The atoms emitting these lines range from neutral to highly ionized, i.e., many of the electrons are stripped off the ion, leaving it highly charged. This wide range of ionization shows that the gas is highly irradiated by the quasar, not merely hot, and not by stars, which cannot produce such a wide range of ionization. This view, taken with infrared light, is a false-color image of a quasar-starburst tandem with the most luminous starburstever seen in such a combination. Since quasars exhibit properties common to all active galaxies, the emissions from quasars can be readily compared to those of smaller active galaxies powered by smaller supermassive black holes. To create a luminosity of 10(40) watts (the typical brightness of a quasar), a super-massive black hole would have to consume the material equivalent of 10 stars per year. The brightest known quasars devour 1000 solar masses of material every year. The largest known is estimated to consume matter equivalent to 600 Earths per minute. Quasars ‘turn on and off’ depending on their surroundings, and since quasars cannot continue to feed at high rates for 10 billion years, after a quasar finishes accreting the surrounding gas and dust, it becomes an ordinary galaxy. Quasars also provide some clues as to the end of the Big Bang’s reionization. The oldest known quasars (redshift ≥ 6) display a Gunn-Peterson trough and have absorption regions in front of them indicating that the intergalactic medium at that time was neutral gas. More recent quasars show no absorption region but rather their spectra contain a spiky area known as the Lyman-alpha forest. This indicates that the intergalactic medium has undergone reionization into plasma, and that neutral gas exists only in small clouds. Quasars show evidence of elements heavier than helium, indicating that galaxies underwent a massive phase of star formation, creatingpopulation III stars between the time of the Big Bang and the first observed quasars. Light from these stars may have been observed in 2005 using NASA’s Spitzer Space Telescope, although this observation remains to be confirmed. Picture shows a famous cosmic mirage known as the Einstein Cross, and is a direct visual confirmation of the theory of general relativity. 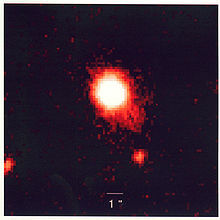 The first quasars (3C 48 and 3C 273) were discovered in the early 1960s by Allan Sandage and others. Many were recorded as radio sources with no corresponding visible object. Using small telescopes and the Lovell Telescope as an interferometer, they were shown to have a very small angular size. Hundreds of these objects were recorded by 1960 and published in the Third Cambridge Catalogue as astronomers scanned the skies for their optical counterparts. In 1960, the radio source 3C 48 was finally tied to an optical object. Astronomers detected what appeared to be a faint blue star at the location of the radio source and obtained its spectrum. Containing many unknown broad emission lines, the anomalous spectrum defied interpretation—a claim by John Bolton of a large redshift was not generally accepted. In 1962 a breakthrough was achieved. Another radio source, 3C 273, was predicted to undergo five occultations by the moon. Measurements taken by Cyril Hazard and John Bolton during one of the occultations using the Parkes Radio Telescope allowed Maarten Schmidt to optically identify the object and obtain an optical spectrum using the 200-inch Hale Telescope on Mount Palomar. This spectrum revealed the same strange emission lines. Schmidt realized that these were actually spectral lines of hydrogen redshifted at the rate of 15.8 percent. This discovery showed that 3C 273 was receding at a rate of 47,000 km/s. This discovery revolutionized quasar observation and allowed other astronomers to find redshifts from the emission lines from other radio sources. As predicted earlier by Bolton, 3C 48 was found to have a redshift of 37% of the speed of light. So far, the clumsily long name ‘quasi-stellar radio sources’ is used to describe these objects. Because the nature of these objects is entirely unknown, it is hard to prepare a short, appropriate nomenclature for them so that their essential properties are obvious from their name. For convenience, the abbreviated form ‘quasar’ will be used throughout this paper. Later it was found that not all (about 10%) quasars have strong radio emission (are ‘radio-loud’). Hence the name ‘QSO’ (quasi-stellar object) is used (in addition to ‘quasar’) to refer to these objects, including the ‘radio-loud’ and the ‘radio-quiet’ classes. One great topic of debate during the 1960s was whether quasars were nearby objects or distant objects as implied by their redshift. It was suggested, for example, that the redshift of quasars was not due to the expansion of space but rather to light escaping a deep gravitational well. However a star of sufficient mass to form such a well would be unstable and in excess of the Hayashi limit. Quasars also show ‘forbidden’ spectral emission lines which were previously only seen in hot gaseous nebulae of low density, which would be too diffuse to both generate the observed power and fit within a deep gravitational well. There were also serious concerns regarding the idea of cosmologically distant quasars. One strong argument against them was that they implied energies that were far in excess of known energy conversion processes, including nuclear fusion. At this time, there were some suggestions that quasars were made of some hitherto unknown form of stable antimatter and that this might account for their brightness. Others speculated that quasars were awhite hole end of a wormhole. However, when accretion disc energy-production mechanisms were successfully modeled in the 1970s, the argument that quasars were too luminous became moot and today the cosmological distance of quasars is accepted by almost all researchers. 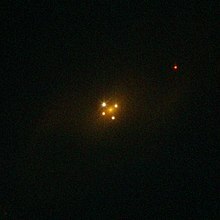 In 1979 the gravitational lens effect predicted by Einstein’s General Theory of Relativity was confirmed observationally for the first time with images of the double quasar0957+561. In the 1980s, unified models were developed in which quasars were classified as a particular kind of active galaxy, and a consensus emerged that in many cases it is simply the viewing angle that distinguishes them from other classes, such as blazars and radio galaxies. The huge luminosity of quasars results from the accretion discs of central supermassive black holes, which can convert on the order of 10% of the mass of an object into energy as compared to 0.7% for the p-p chain nuclear fusion process that dominates the energy production in sun-like stars. This mechanism also explains why quasars were more common in the early universe, as this energy production ends when the supermassive black hole consumes all of the gas and dust near it. This means that it is possible that most galaxies, including our own Milky Way, have gone through an active stage (appearing as a quasar or some other class of active galaxy that depended on the black hole mass and the accretion rate) and are now quiescent because they lack a supply of matter to feed into their central black holes to generate radiation. Because quasars are extremely distant, bright, and small in apparent size, they are useful reference points in establishing a measurement grid on the sky. The International Celestial Reference System (ICRS) is based on hundreds of extra-galactic radio sources, mostly quasars, distributed around the entire sky. Because they are so distant, they are apparently stationary to our current technology, yet their positions can be measured with the utmost accuracy by Very Long Baseline Interferometry (VLBI). The positions of most are known to 0.001 arcsecond or better, which is orders of magnitude more precise than the best optical measurements. A multiply imaged quasar is a quasar whose light undergoes gravitational lensing, resulting in double, triple or quadruple images of the same quasar. 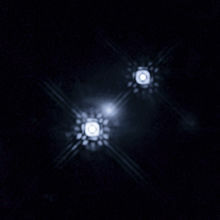 The first such gravitational lens to be discovered was the double-imaged quasar Q0957+561 (or Twin Quasar) in 1979. A grouping of two or more quasars can result from a chance alignment, physical proximity, actual close physical interaction, or effects of gravity bending the light of a single quasar into two or more images. As quasars are rare objects, the probability of three or more separate quasars being found near the same location is very low. The first true triple quasar was found in 2007 by observations at the W. M. Keck Observatory Mauna Kea, Hawaii. LBQS 1429-008 (or QQQ J1432−0106) was first observed in 1989 and was found to be a double quasar; itself a rare occurrence. When astronomers discovered the third member, they confirmed that the sources were separate and not the result of gravitational lensing. This triple quasar has a red shift of z = 2.076, which is equivalent to 10.5 billion light years. The components are separated by an estimated 30–50 kpc, which is typical of interacting galaxies. Another example of a triple quasar formed by lensing is PG1115 +08. 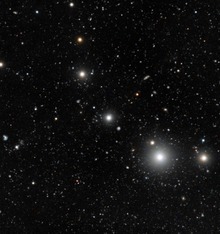 In 2013, the second true triplet quasars QQQ J1519+0627 was found with redshift z = 1.51 (approx 9 billion light years) by an international team of astronomers led by Farina of the University of Insubria, the whole system is well accommodated within 25′′ (i.e., 200 kpc in projected distance). The team accessed data from observations collected at the La Silla Observatory with the New Technology Telescope (NTT) of the European Southern Observatory (ESO) and at the Calar Alto Observatory with the 3.5m telescope of the Centro Astronómico Hispano Alemán (CAHA). When two quasars are so nearly in the same direction as seen from Earth that they appear to be a single quasar but may be separated by the use of telescopes, they are referred to as a “double quasar”, such as the Twin Quasar. These are two different quasars, and not the same quasar that is gravitationally lensed. This configuration is similar to the optical double star. Two quasars, a “quasar pair”, may be closely related in time and space, and be gravitationally bound to one another. These may take the form of two quasars in the same galaxy cluster. This configuration is similar to two prominent stars in a star cluster. A “binary quasar”, may be closely linked gravitationally and form a pair of interacting galaxies. This configuration is similar to that of a binary star system.